SuperSpeed USB3.0 provides transfer speed of up to 5 Gbps, 10 times faster than USB2.0, and backwards compatible with high speed USB2.0 and full-speed USB1.1 devices. 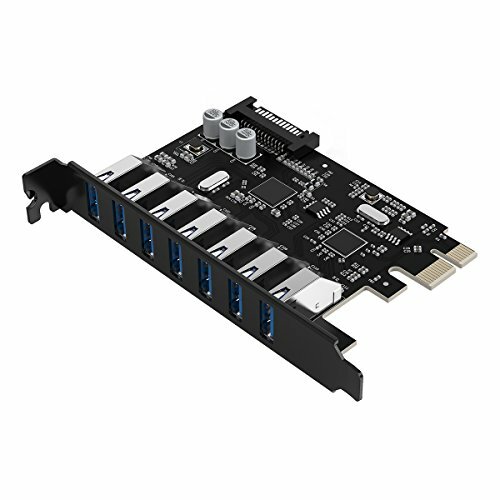 The 7 ports USB 3.0 PCI-E expansion card is an ideal selection to external storage device, it's able to simultaneously connect with the existing USB peripherals and maintain the compatible status. The expansion card works great with Windows XP, Vista,7,8,8.1,10, meets most of your needs. This expansion card adopts high-performance master controller chip, luxurious materials, integrated solid capacitance and excellent PCBA processing technology, which ensures the stability of hardware extensions and efficiency of data transmission. The USB interfaces offer 5V0.9A power supply for external device, adds 15PIN SATA interface for optional power supply. Adequate and stable, you do not need to worry about the problem of power supply match. Our official website is repaired now, please download the driver on the webiste. If there were any other problem, welcome to contact our technical support team.